Aaron is our Nursing Department Head Nurse, and HR Manager. Aaron loves all animals and people, but has a special fondness for large dogs. He had 16 years experience when he joined us in 2006. Aaron graduated 2nd in his class at Western Career College in 1993. He then went one to receive his Bachelors in Business Administration degree with special focus on Management in 2002 from Saint Lourdes University. In addition to the usual RVT training, he also has had several years of management training and 5 years experience managing 5 hospitals. 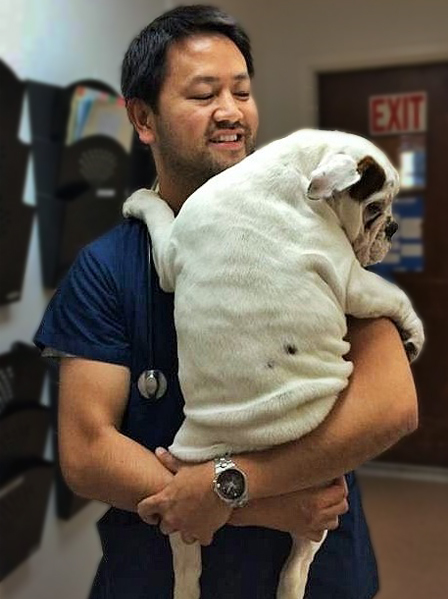 Although he is very talented in management, He is pleased to be back in general practice at San Bruno Pet. He functions not only as our Nursing Department Manager, but also our Human Resource Manager here at San Bruno Pet. He lives in San Francisco with his life partner of 7 years, and loves their pampered/special needs Old English Bull Dog, Turbo. In his time off, he enjoys weight training and going out with friends. Aaron has been instrumental in creating a cohesive and collaborative effort amongst the entire staff here at San Bruno Pet. You will find that he is articulate and outgoing. He is also our advice nurse. Aaron has spent many years assisting us to build a very talented and experienced team in order to allow our practice to flourish and be successful. Aaron loves his family very much and makes sure that our practice runs in a very efficient manner. 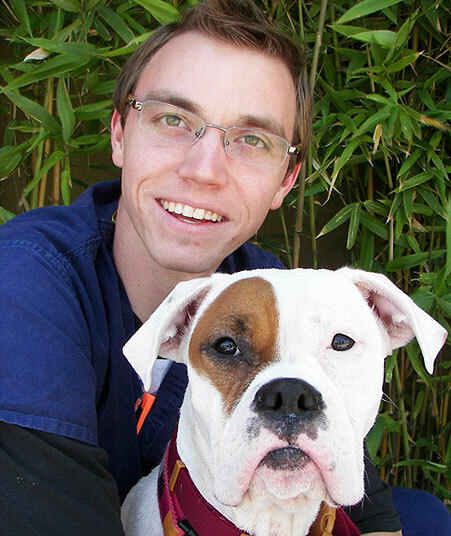 Zac joined San Bruno Pet Hospital in 2008 as a technician and is great handling your pets. Heralding from Hawaii, Zac now lives in Pacifica with friends and his rescued Boxer “Isabella.” She is a bundle of excitement when you meet her and is a survivor of Parvovirus. With over 5 years of veterinary experience and attending Skyline College, Zac has been a great addition to our team. Paula started working at our hospital in 1996 as a kennel attendant. After two short years she was promoted to the treatment room as a veterinary assistant. She took a break from veterinary medicine in the year 2000 but was asked to return in 2004. Paula has been a valuable core member of our nursing team for well over 14 years now. With her infectious smile and positive attitude, it’s impossible for your pets not to love Paula. 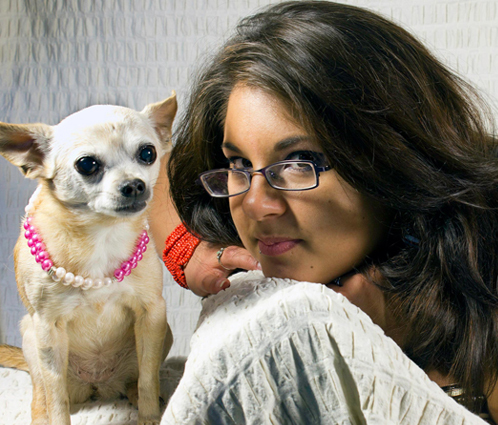 As our resident chihuahua whisperer, she shares her home with five dogs and three cats. Allan has been in the veterinary field for over 13 years in which he has gained valuable experience in both general practice and emergency medicine. He recently held a 5 year position as a technician supervisor at another hospital and although he does not mind the administrative responsibilities, he is excited to have more direct, hands on interactions with our patients.  Allan is great with handling animals, is detail oriented and has great organizational skills. His professional interest are assisting with dentals and procedures, utilizing the ultrasound and x-ray machines, teaching and training, as well as trouble shooting and keeping up with equipment maintenance. Being a bay area native, Allan grew up in Daly City then moved to San Mateo about 6 years ago where he currently lives with his girlfriend. On his days off, he enjoys hikes, bike rides, camping, photography and anything else that has to do with nature. Kimberlia (Lia) was born in Santa Cruz, CA but spent the last 16 years living in Kansas. 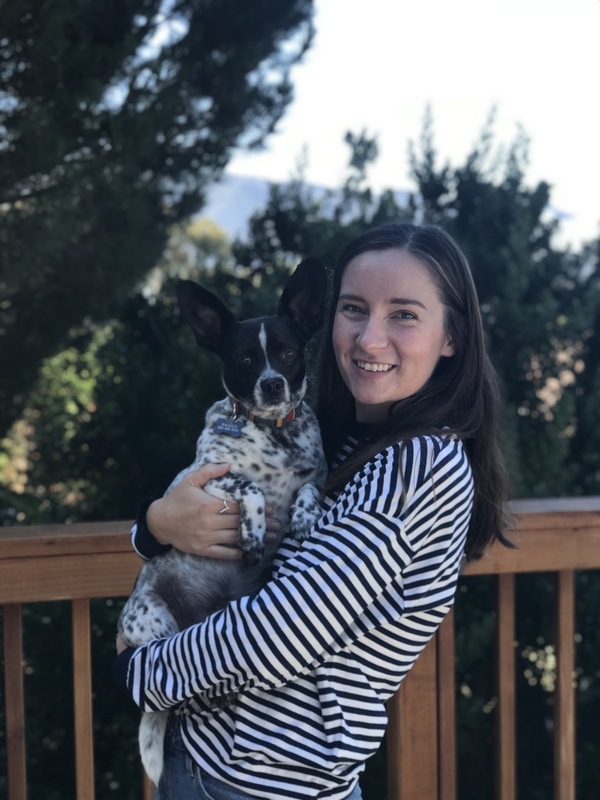 She started working in the human medical field at the age of 16, but then decided to switch to animal medicine and went to school at Brown Mackie College to become an RVT. 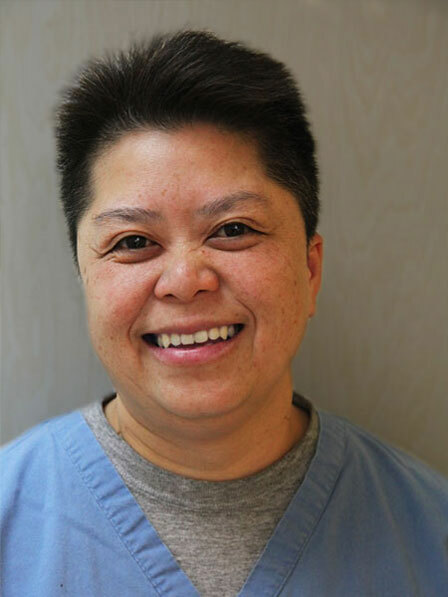 She enjoys assisting in surgery, taking radiographs, and client education. She has two dogs that are rescues, one a chihuahua poodle mix and the other a chihuahua. She loves talking about her dogs and she has a soft spot for old small dogs. On her days off you can find her sitting outside somewhere with her nose stuck in a book. Zina has always had a curiosity as well as a special soft spot for animals. Although she learned a lot from her own pets growing up, her professional experience really started as a volunteer. In 2012, she started volunteering at the ASPCA Wildlife Department, where she focused on the rehabilitation of the wounded and the abandoned. Soon after, she realized she had a real passion for all types of animals and went on to volunteer at the San Francisco Zoo. As her passion for animals grew, she had the opportunity to work and study at Banfield Pet Hospital where she became a Vet Technician. Her favorite part about working at a pet hospital is that it’s not a job, it’s a passion. 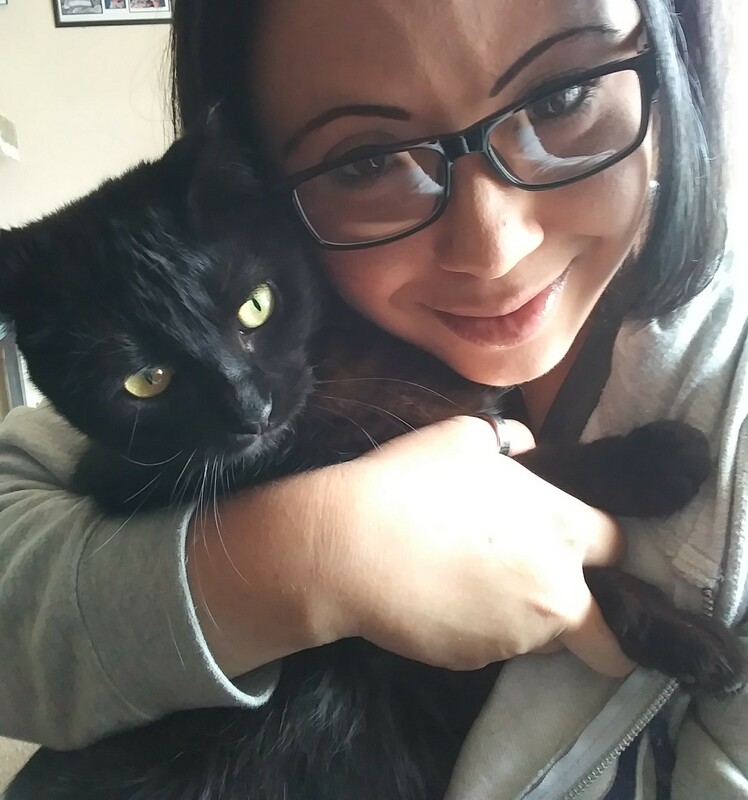 With an eagerness to learn and a special soft spot that has only grown, she is excited to be a part of the San Bruno team and can’t wait to work with you to keep your furry, four-legged friend happy and healthy. A Sacramento native, Kelsey graduated from UC Davis and moved to the Pacifica to pursue her passion for animal care. 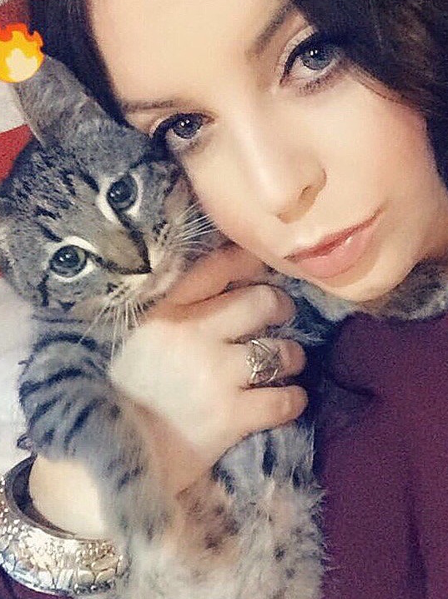 A true kitty-lover, she has two rescue cats, Angel and Luna (pictured here with her). Kelsey loves to give our dog and cats boarders extra hugs when they stay with us. Born and raised in San Mateo County, Jennifer’s home was always full of animals: ducks, cats, and lots of fish—including some really cool seahorses and lionfish. Her family fostered animals regularly and enjoyed the process of finding just the right home for every four-legged friend that came to them for care and rehoming. Jennifer worked in education for over a decade and made the jump to animal care several years ago, where she’s been employed in both boarding and doggie daycare. 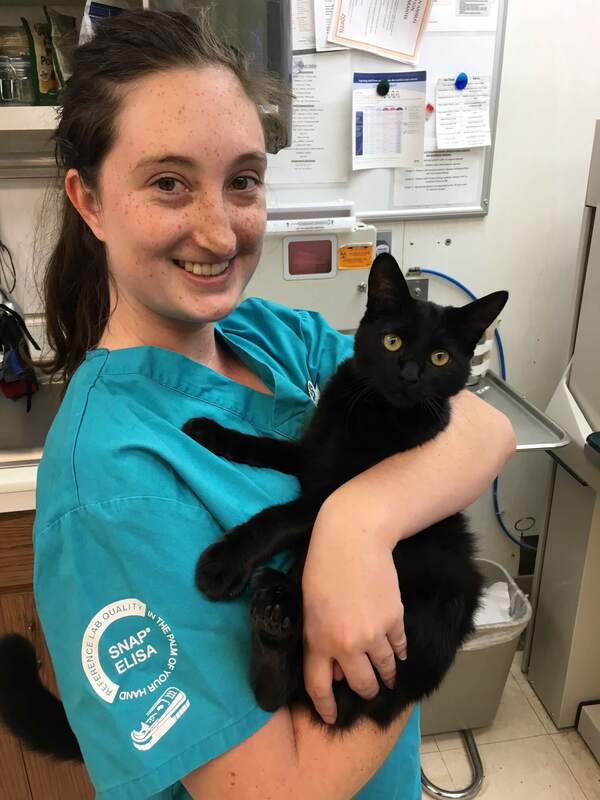 She very much enjoys caring for—and cuddling with—our patients and guests and hopes to one day become a veterinary technician. Devon has loved animals for as long as she can remember, and is excited to help take care of yours! She grew up in Pacifica, and currently lives in San Bruno. She is a 2015 graduate from UC Santa Cruz with a degree in Ecology and Evolutionary Biology. In her free time, Devon loves playing and watching sports, being outside, and hopes to someday learn to cook! She is a proud dog mom to her rescue pup, Raider. Debbie is the Lead Receptionist and manager of customer service at the hospital. 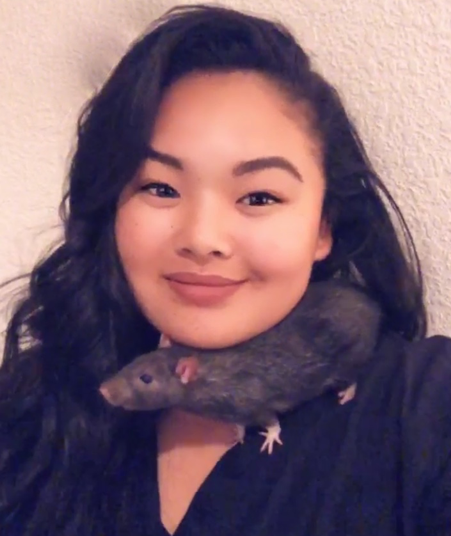 She has been working at San Bruno Pet since 2009 and she brings a lot of knowledge to the hospital with her Bachelors degree in Animal Science from UC Davis. She lives in South San Francisco with friends and their dog Posey. Posey is a chiweenie parvo survivor named after Buster Posey. Debbie is an avid nature lover and enjoys going hiking as well as deep sea and fresh water fishing in her free time. 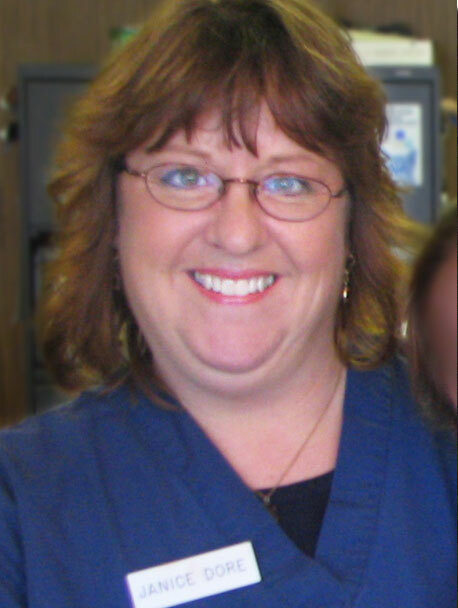 Janice joined us in 2006 and has 20 + years working in veterinary medicine. Janice is also one of our feline advocates at San Bruno Pet Hospital. In her spare time away from the hospital she is a Certified Massage Therapist and also does Reike (Energy Work) with people and animals. Janice also loves to swim and spend time at the beach. Her rescue cat “Mama Kitty” who had two kittens in tow at the time of her rescue (thus the name) were socialized by Janice and both found forever homes through PHS/SPCA. “Mama Kitty” was so feral when Janice trapped her, when she was spayed at the SPCA they told Janice she was unadoptable. So Janice picked her up and released her back in to her feral environment. Janice is happy to report that after six long years of Love & Patience “Mama Kitty” has learned how to purr and enjoy the good life of mostly indoor living. technician with a contagious, warm smile. 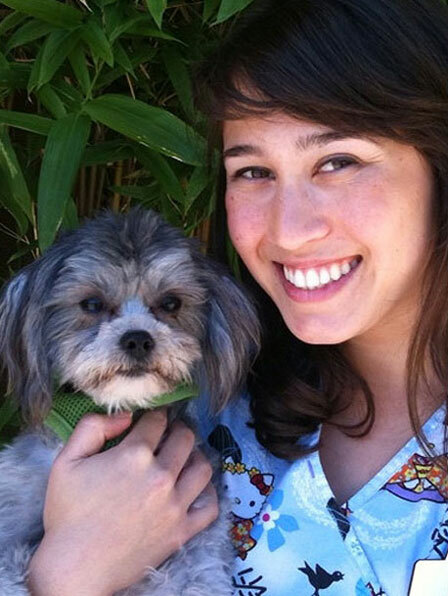 Pearl joined us with 10 years experience working at Colma Pet Hospital and Bayshore Hospital. No matter what is going on, she always seems to have a welcoming smile. Tiffany is a talented artist and experienced customer service representative from Pacifica California. She is very passionate about animals, their health, and their well being. She prides herself on her hard work ethic and positive attitude. When she isn’t working you can find her reading a good book on the beach, spending time with her cat Noodle, and painting. Tiffany has plans to pursue her dream in the veterinary field by taking veterinary technician courses. Jen is Hospital Manager. 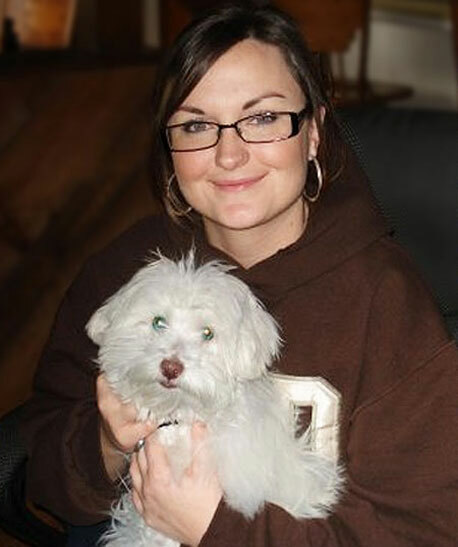 She joined San Bruno Pet in 2007 and loves to help answer any of your questions. She lives on the Peninsula with family which includes her Malteses Chewy & Charlie, Boxer mix Izzy, and her cats Bitty and Nimbus. She enjoys hiking through the coastal hills and Pacifica trails. She is also a passionate Golden State Warriors fan. 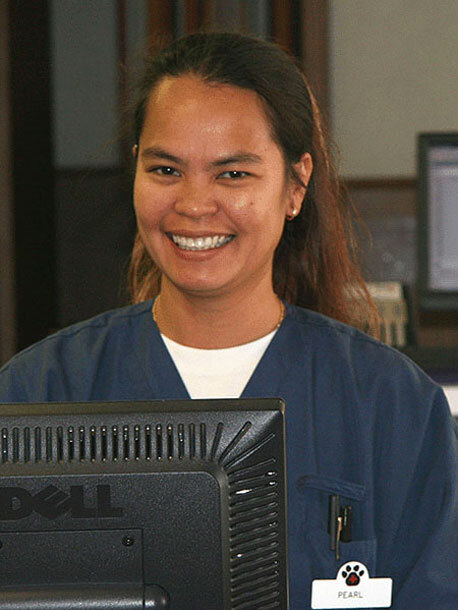 Jen cares deeply about all of our patients and always tries to greet them with a smile.